In keeping with yesterday's theme of excellence in your work, I found these pictures of the best way to alter pants. This is the kind of thing that keeps me in business. Please, we all have our strengths, now. Clearly, this person needs to step away from the needle and thread! Here in the States we have just celebrated our Thanksgiving holiday. We enjoy a big meal and time with family, football games, naps and more food! 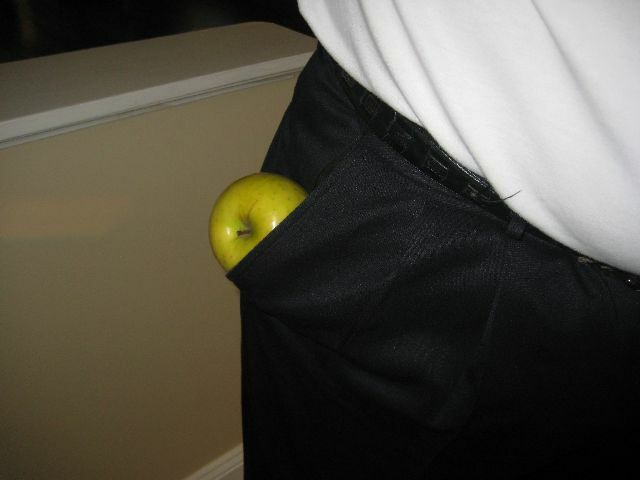 If you feel like letting out your slacks may be necessary, go for it. The job is really not that difficult! 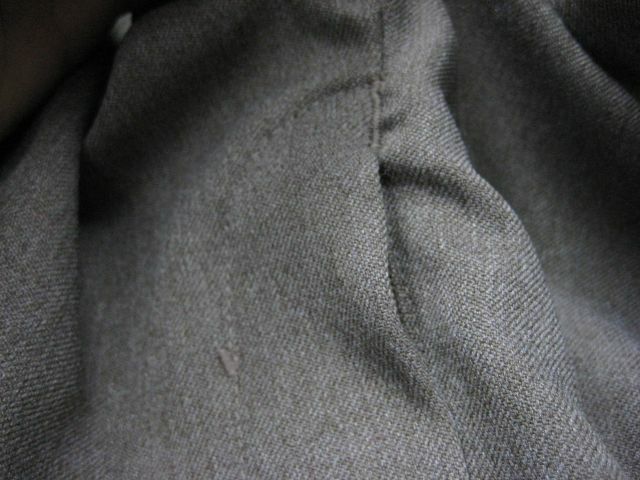 Your slacks will look somewhat like this on the inside. 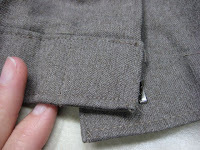 Release the stitching that attaches the waistband to the pants. 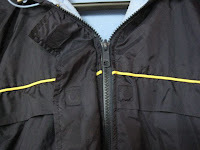 You will also have to remove the beltloop at the center back. The inside will now look something like this, so you can grab the seam allowance with two fingers. 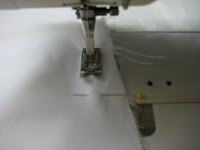 Line it up evenly, right sides together. 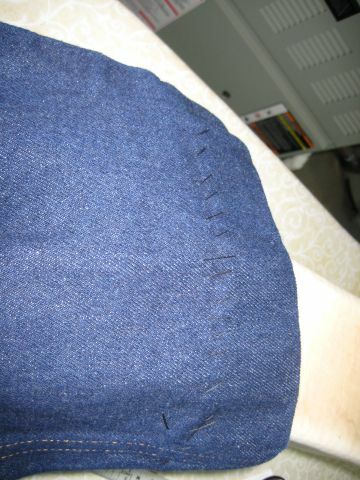 The next step is to sew your new seam. 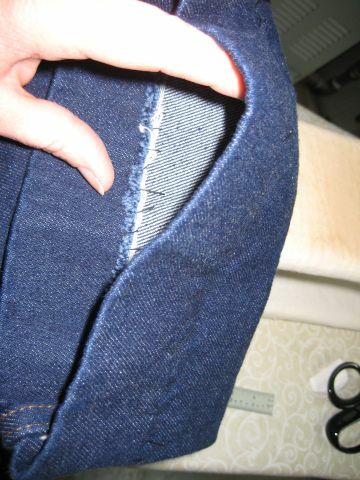 It will be closer to the raw edges, according to whatever you have measured as your new waist size. 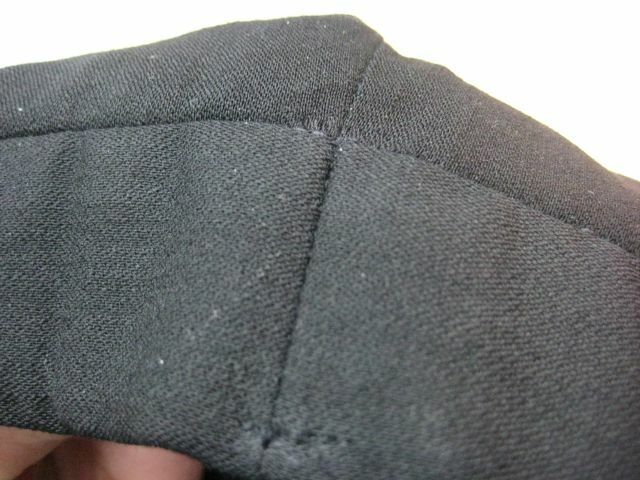 Remove the old stitching. Remove the little pieces of thread that remain after you've used your seam ripper or blade. Press well. 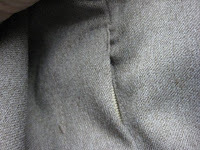 Stitch in the ditch across the seam where the waistband meets the slacks. 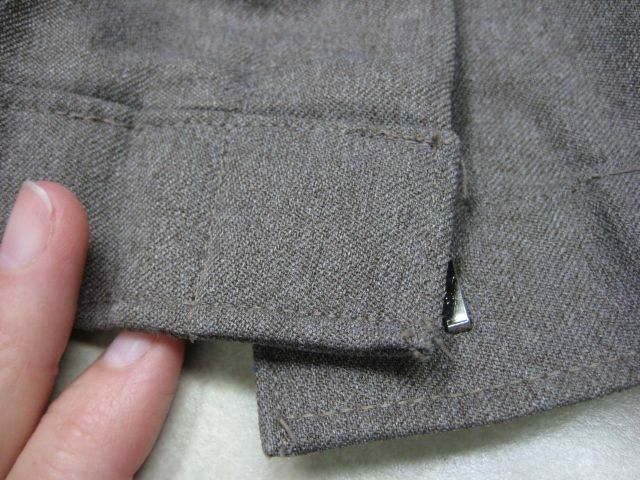 Attach the beltloop, bottom edge first. Press well again, or take your slacks to your neighborhood cleaners for a professional finish. Now go have another slice of pumpkin pie! 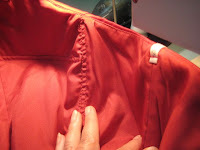 So, even though I've been doing alterations for many, many years, I still make my share of mistakes, most of which are easy to correct. Don't let the possibility of messing something up stop you from trying. Experiment, practice and keep moving on! 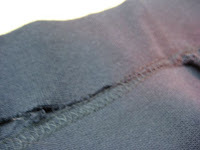 Obviously, this zipper replacement did not turn out well. When I got it all finished, the two sides were off by a good ½". 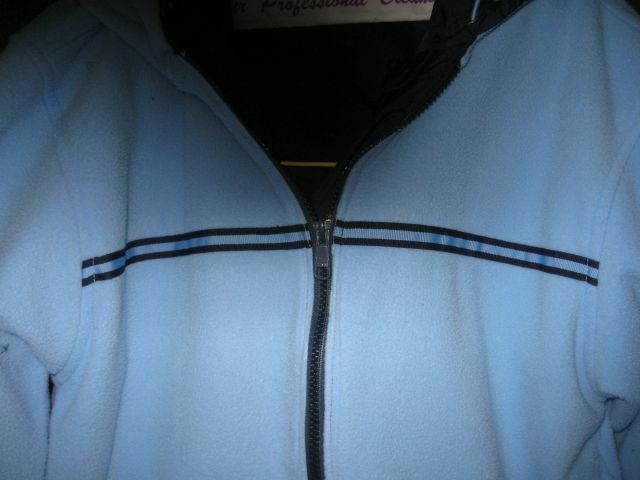 After closer examination, I can see that the zipper teeth do not even line up correctly. 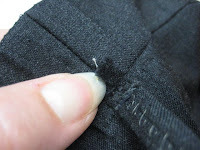 And I can see that the problem began at the very start, when I did not line up the two sides of the slacks at the base of the zipper. 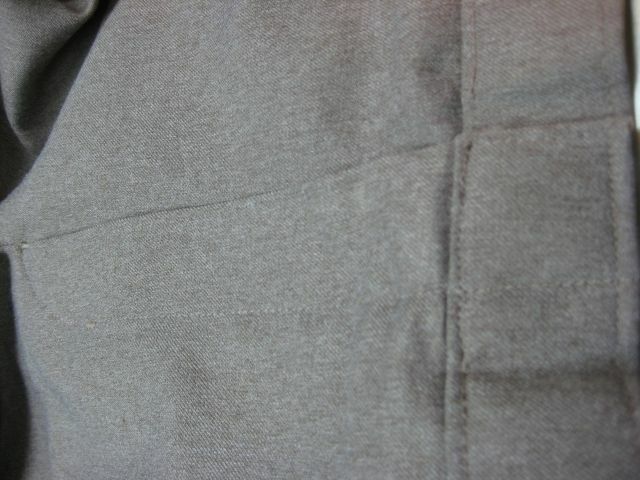 Here you can see that the fabric has some stretch in it. 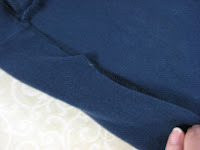 Knowing that the ends were not matching up well, I tried to stretch one side to fit into the other, thinking that a little wrinkling would come out with a good burst of steam. But, oh, not so. 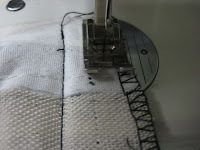 You can't fool the fabric into behaving when it wasn't set right in the beginning. 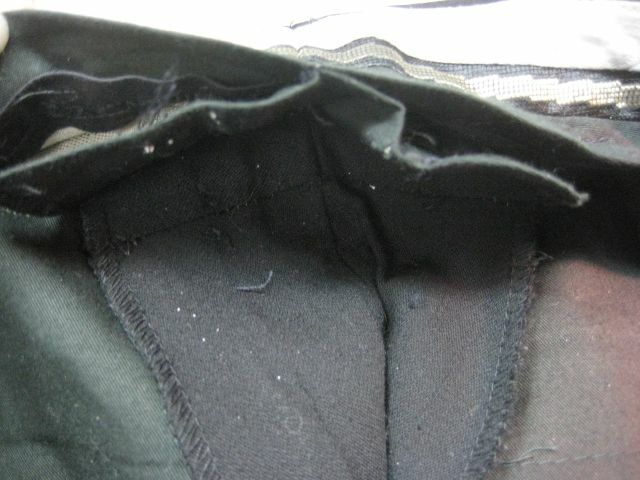 And what is up with that shotty looking bar tack to the left of the zipper? Was I in a hurry? Ahhhh, that's much better. 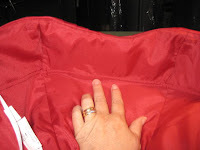 Take out the one side of the zipper, realign and put it back in. 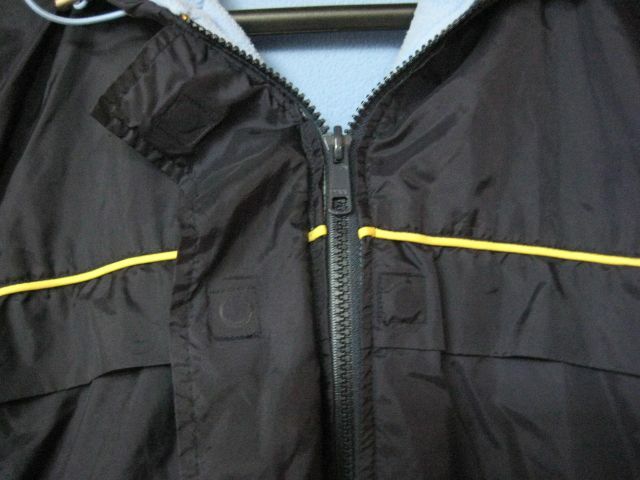 Then since I had to remove that bar tack anyway, I resewed it, making it a much more professional looking job. 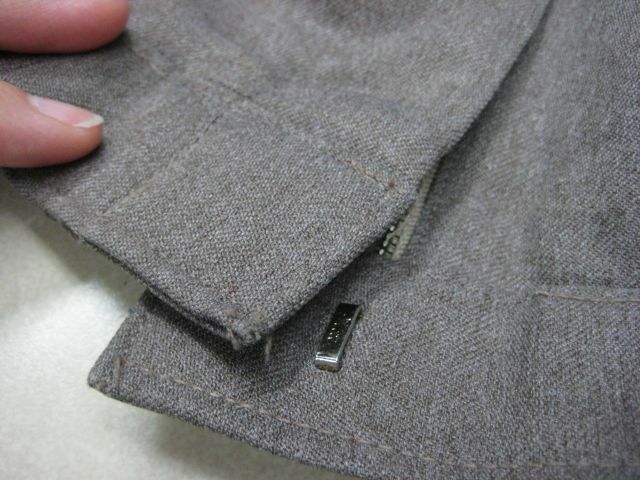 In the end, there is no substitute for attention to detail. 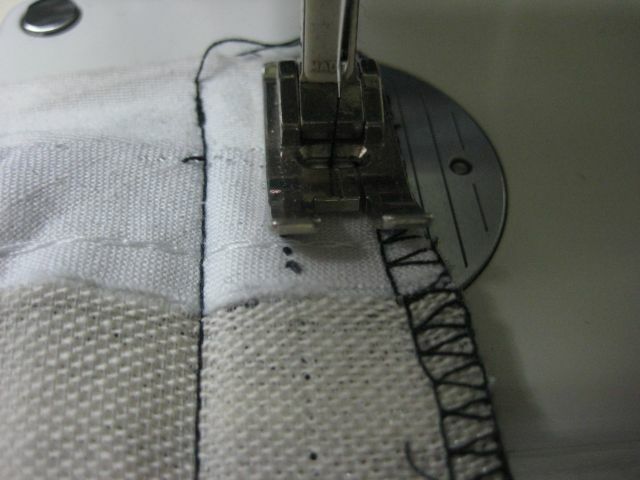 I tried to rush this job through and ended up taking additional time, because I had to correct my mistakes. 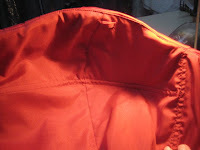 On this lesson, I didn't learn how to put in a zipper, I learned how to use patience to put in a zipper well. 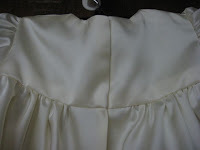 The next step was to tack the lining to the bodice. This I did on the inside, by hand. 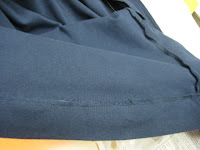 Then I serged around the armholes, after the sleeves had been attached.This gives a finished look without a lot of trouble. 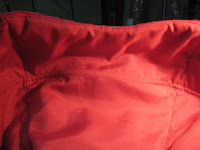 Most of the back closure was done when I machine stitched the lining to the bodice. 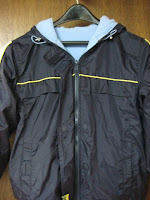 It created a smooth even edge at the center back. I attached clear snaps the the seamline and the neckline. 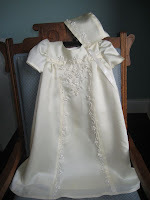 These are easy to fasten on a baby who might not be holding still for a button and buttonhole! 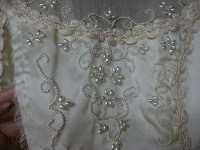 I also made a bonnet, using the beaded fabric from the front of the wedding gown. 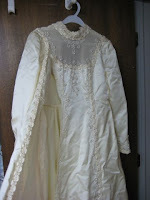 The finished bonnet and gown are pictured below. 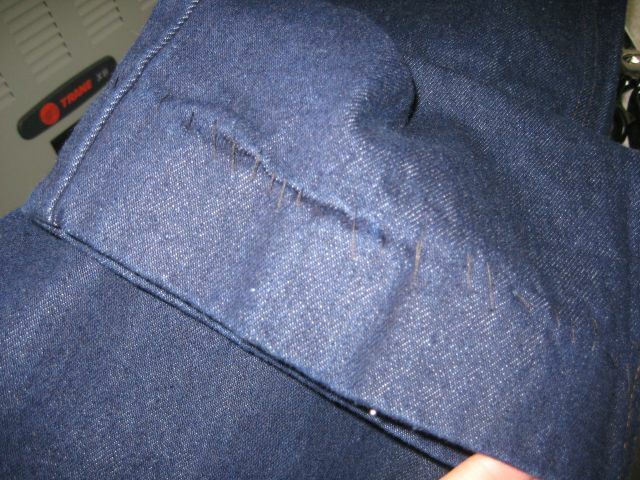 Today's project is a MAJOR alteration. 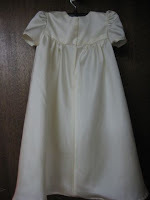 I am making a Christening gown for a 6 month old baby. The fabric and ornamentation will come from her grandmother's wedding gown. 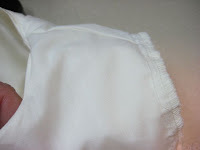 I started by making a muslin and trying it on the baby. It was my youngest fitting ever!! 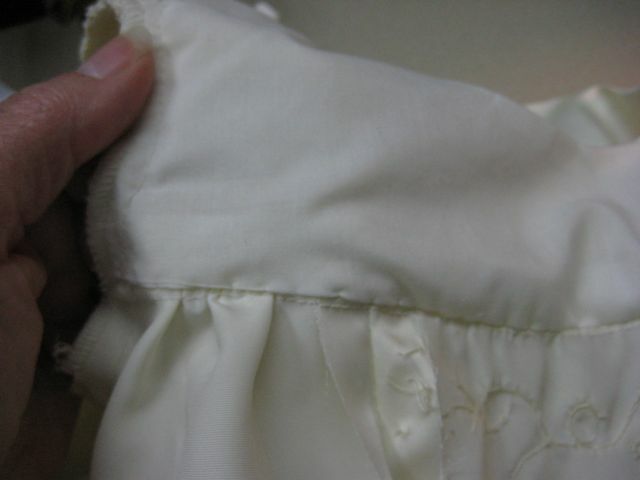 The wedding gown is pictured here, after I began carefully ripping along the princess seam, removing the lace as I split open the seam. 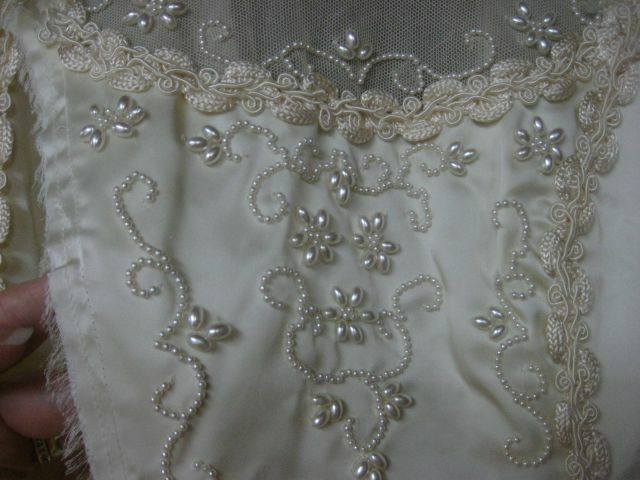 The bodice of the dress looks like this, so I am going to preserve the beads for the baby's front skirt. After removing the center piece, as shown here, I need to decide how to get this flat piece into the dress that is all gathered beneath the yolk. 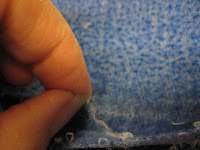 Although the piece is tapered, I removed some of the beads and straightened out the top edge. The last picture here shows the center piece pinned to the center of the muslin. 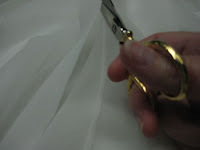 I now can cut out the rest of the pattern pieces using the muslin pieces as a pattern. 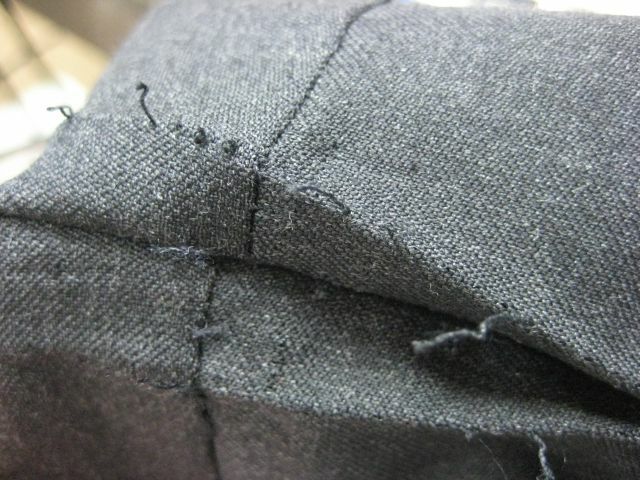 I will assemble them as the pattern directions instruct. 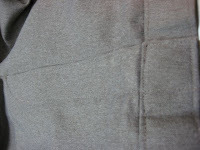 Tomorrow I will show the finished product. My son made my day today. He told me how lucky he felt to have a seamstress for a mom. 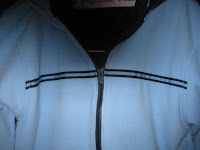 I had sewn the captain's "C" onto his hockey jersey. Although it's not a true alteration, I thought some of you could relate! Things People Do to Keep me in the Alterations Business! 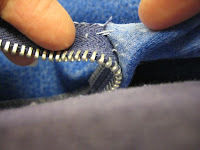 I guess over the last 26 years or so, I've replaced hundreds and hundreds of zippers. This includes zippers on slacks, tops, skirts, jackets, wedding gowns, bridesmaid dresses, Halloween costumes and even a pair of boots! 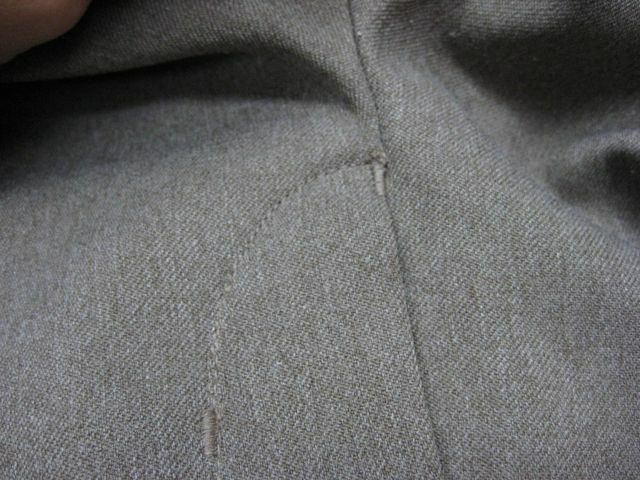 The most time consuming thing about any alterations is the ripping. 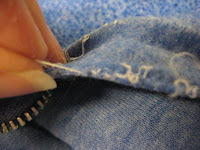 And once the ripping is done, picking out the loose threads and cleaning up the area will take even more of your time. This is a sign of a quality job, though. Don't cut this process short. 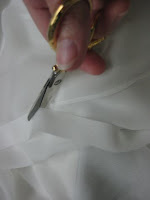 I can share a little trick with you today. 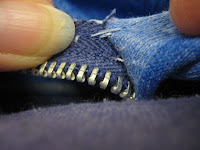 When you rip out a zipper, you don't necessarily have to rip each stitch with your seam ripper. 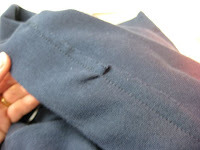 If the fabric around the zipper is stable enough, you can literally rip the zipper right off the garment. Of course you want to test a small area first, and don't pull too hard if the fabric won't give. But chances are, this will work for you and save you a lot of time. 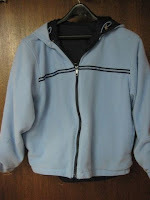 This is a pullover jacket made of sweatshirt jersey fabric. Picking out the threads is a different story, though. 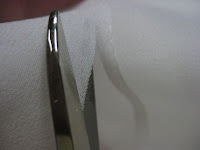 I haven't found a shortcut for this tedious task, other than doing it while you are watching a movie or talking on the phone. After all, it is a pretty mindless task. 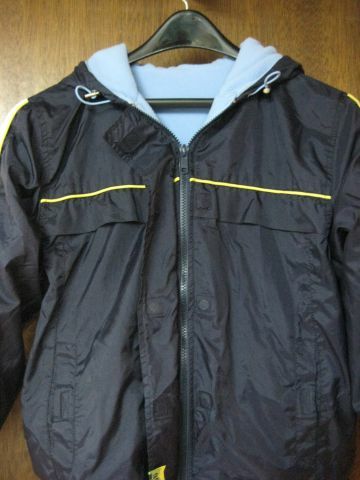 So go rip out a zipper. 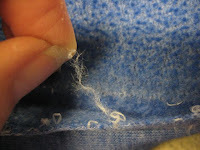 Clean up the threads and get ready to put in a new one! The pictures I've chosen to share with you today are a bit unique. 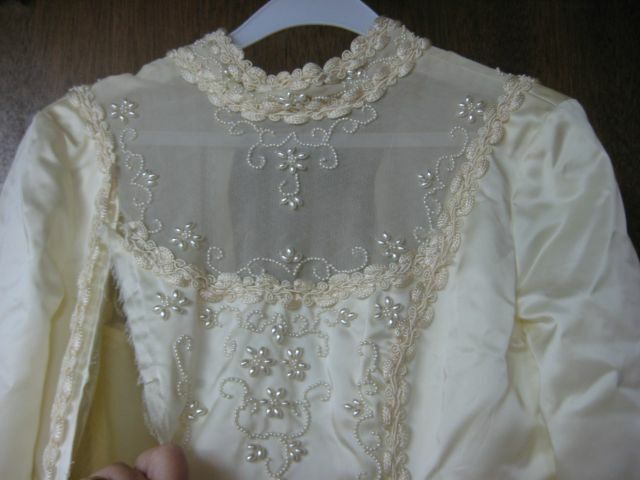 They show the inside of a bridesmaid dress. Can you guess what's unusual about this? Look closely at the boning. 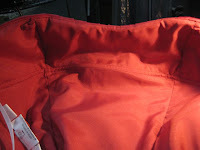 The manufacturer has chosen to put horizontal boning in, beneath the bustline. At first glance this seems like a good idea. 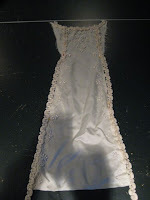 It's almost like an underwire bra built right into the dress! 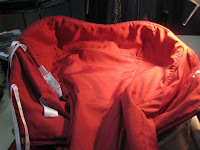 It is a bit limiting, though, because the "girls" cannot be much bigger than the space allows, otherwise the boning will ride up in an uncomfortable way. If the seamline is kept down where it belongs, under the bust, then a women who is well endowed will be popping out of the top! On the other hand, I'm sure it provides wonderful support for the bridesmaid who is the right bust size. It may even eliminate the need for a bra. 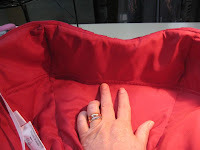 The cup size can still be taken in for a smaller busted woman, but removing the horizontal and vertical boning will be quite time consuming. All in all, this dress proves two things. 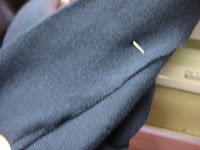 Number one, some alterations simply cannot be done. 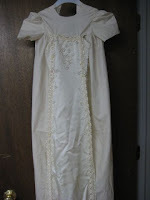 Without additional fabric to provide the right coverage, a bridesmaid who is a bit bigger on the top will never be comfortable wearing a dress with a clearly defined bustline, especially if it includes boning. Number two, support for a dress comes in a variety of forms. 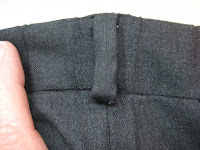 If the inner construction is done well, it can accentuate the bustline in a flattering way, while providing the proper fit in a garment that will show off the wearer's assets!